Have you ever been to the SHAPE America National Convention? Well KAHPERD wants to make sure that answer is yes! 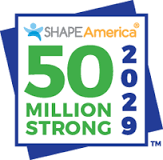 We are excited to announce that we are giving away a free registration to the 2019 SHAPE America National Convention in Tampa, FL that will include hotel accommodations and airfare! So how do you become eligible? Last month KAHPERD launched our new fundraising platform with a single promise, that you and your school always earn the most back from your efforts. KAHPERD wants to revolutionize school fundraising. In fact up to 75% back is our offer, which we believe makes us the number #1 fundraiser for schools to consider! On November 3rd, KAHPERD is hosting the inaugural #173Strong Edventure Race in Downtown Frankfort, KY. If you just smiply sign-up for a fundraising page before October 1st, your name will entered into a drawing for your choice of a free registration to the KAHPERD fall convention or the 2019 KAHPERD summer conference. This is 100% risk free, no requirement or commitments. Also at the fall convention, KAHPERD will be presenting other innovative ways for you to utlize this fundraising platform locally in your own school and community in 2019! The grand prize drawing for SHAPE Tampa will be held on November 3rd before the start of the #173Strong Edventure Race. For every dollar in donation you and your school receive, you will get one entry into the drawing. The more you raise, the more your school gets back and the better your chances of going to SHAPE Tampa in 2019!